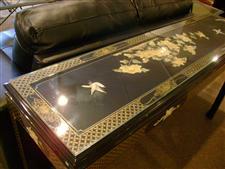 Affordable Consignment Furniture of PA presents: AMAZING AND RARE TO FIND THIS STUNNING CHINOISERIE BLACK LACQUER WOOD TABLE HAND PAINTED AND DECORATED WITH FLOWERS DONE IN MOTHER OF PEARL. AMAZING IN PERSON A MUST FOR ANYONE'S COLLECTION DO NOT MISS IT..Comes with a glass overlay. Please check out our sister store ACF of PA!